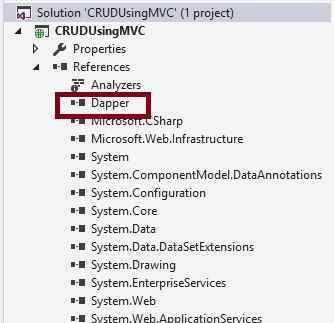 In my last article CRUD Operations In ASP.NET MVC 5 Using Dapper ORM we have learned how create CRUD operations in ASP.NET MVC with the help of Dapper ORM but if you closely observed there is a whole page post back, lots of code and many forms which maximize the process time, and also huge server utilization, so to overcome this we will learn another approach to create the CRUD operations in ASP.NET MVC Using jQuery JSON with Dapper ORM, which will cover the drawbacks of first approach. 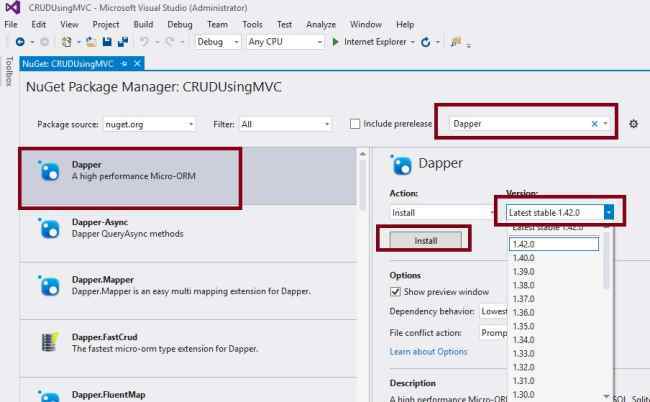 Dapper is the Open source ORM which is used to map Microsoft platform .NET classes to the database. 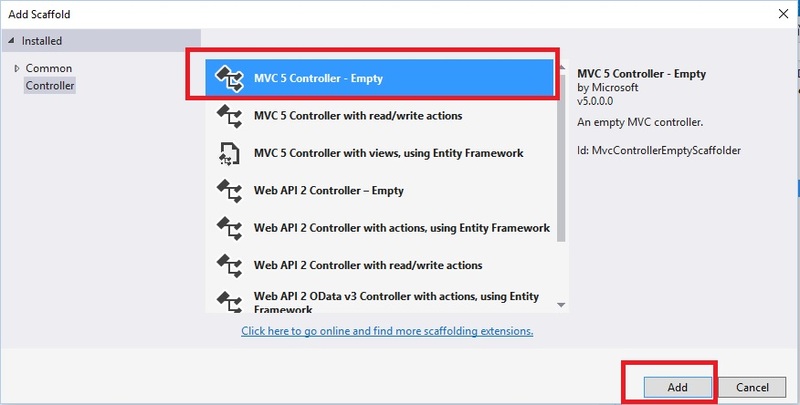 Step 1: Create an MVC Application. Step 2 : Add The Reference of Dapper ORM into Project. Right click on Solution ,find Manage NuGet Package manager and click on it. After as shown into the image and type in search box "dapper". Select Dapper as shown into the image . Choose version of dapper library and click on install button. I hope you have followed the same steps and installed dapper library. Step 3: Create Model Class. Note: It is not mandatory that Model class should be in Model folder, it is just for better readability you can create this class anywhere in the solution explorer. This can be done by creating different folder name or without folder name or in a separate class library. Step 4 : Create Controller. Note: The controller name must be having suffix as 'Controller' after specifying the name of controller. Step 5 : Create Table and Stored procedures. Run the above script in sql it will generates the stored procedure for CRUD operation . 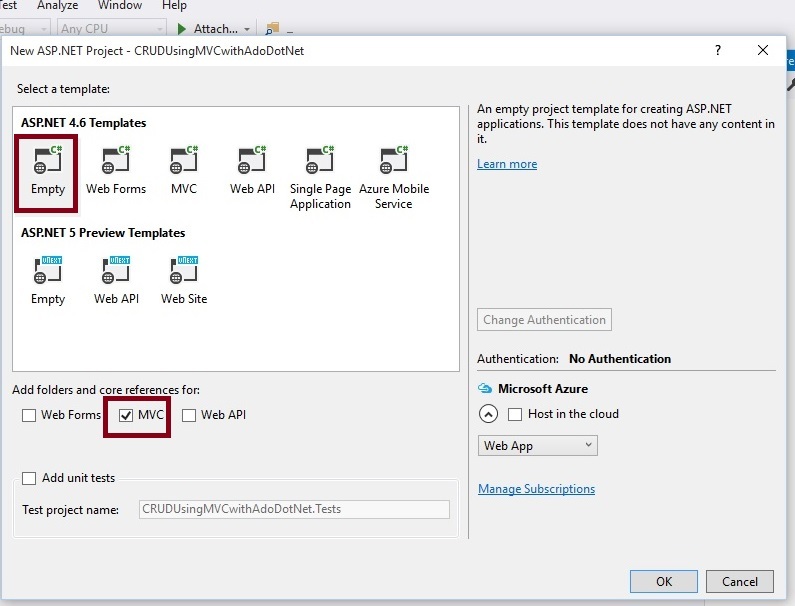 Step 6: Create Repository class. In the above code we are manually opening and closing connection, however you can directly pass the connection string to the dapper without opening it. Dapper will automatically handle it. Log the exception in database or text file as per your convenience, since in the article I have not implemented it . Step 7: Create Methods into the HomeController.cs file. 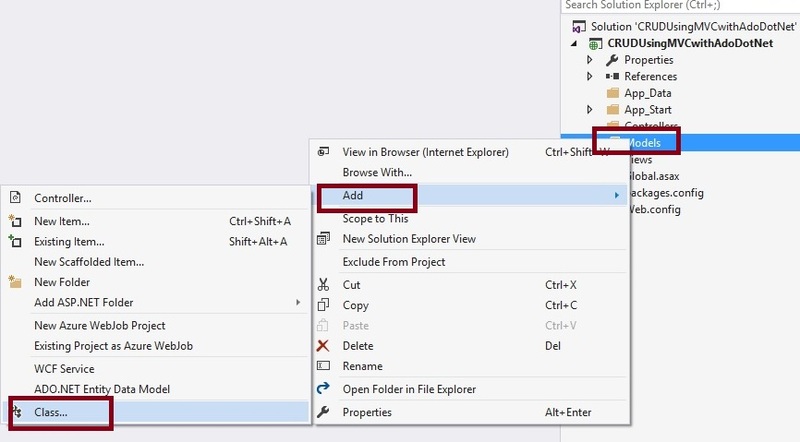 To create the View to add Employees, right click on view folder and then click Add view. 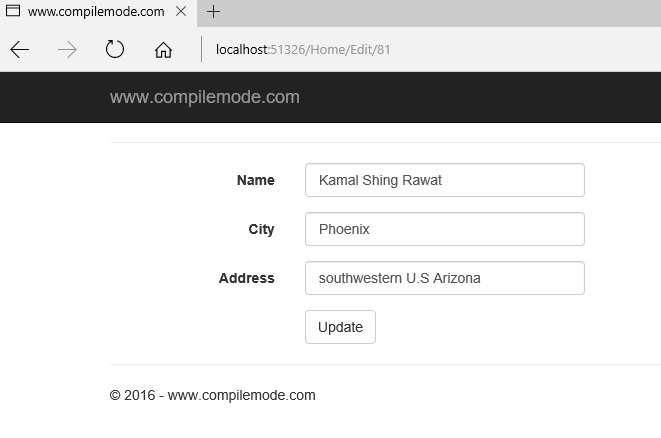 Now specify the view name as AddEmployee or as you wish, template name and model class in EmpModel.cs and click on Add button. 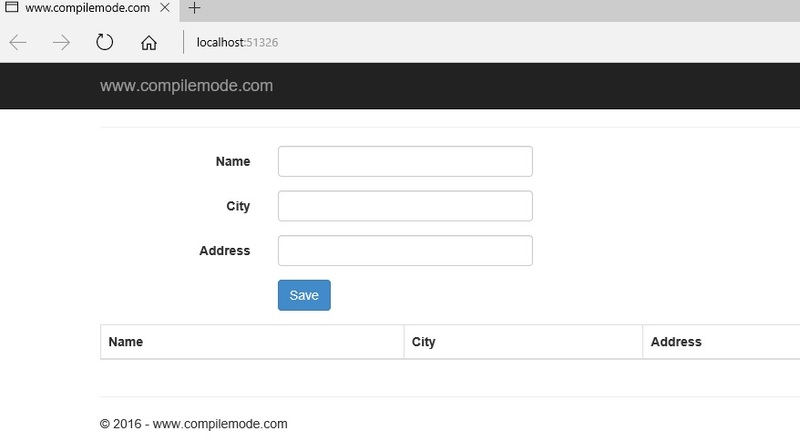 After clicking on Add button it will creates the AddEmployee view having extension .cshtml , Now write the jQuery Ajax post method to insert the records into the database. Now after adding jQuery Ajax post method then AddEmployee.cshtml view source code will be look like as follows. 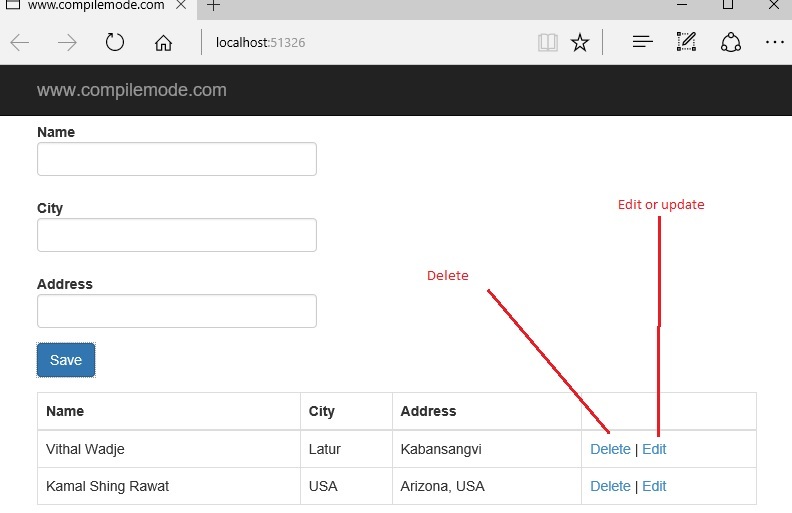 Follow the same procedure and create Edit,cshtml view to edit the employees and create the following jQuery function to update the records. Step 9: Run the Application. Now run the application the AddEmployee view appears as in the following screenshot. Now enter the details like as in following screenshot. And on clicking save button similarly add another record, then the added records get added into the database and it will be displayed in the following table. In the above list of records we added city as USA by mistake so let us edit it by clicking on edit hyperlink then record will be displayed in edit mode correct it as per your need. 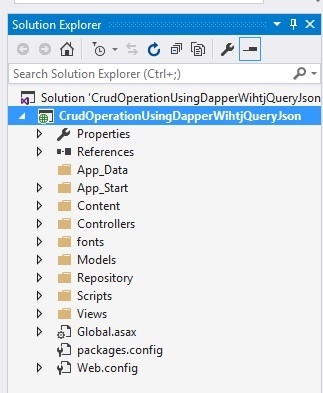 From the preceding examples we have learned how to implement CRUD Operation In ASP.NET MVC Using jQuery Json with Dapper ORM. 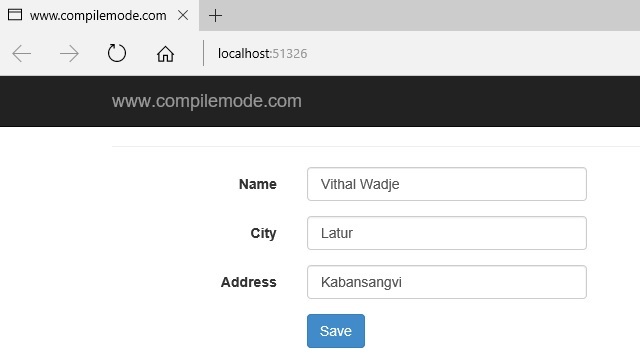 Configure the database connection in the web.config file depending on your database server location. Since this is a demo, it might not be using proper standards, so improve it depending on your skills. This application is created completely focusing on beginners. In the Repository code we manually opening and closing connection, however you can directly pass the connection string to the dapper without opening it, dapper will automatically handled. Log the exception in database or text file as per you convenience, since in this article I have not implemented it. Since we are Using jQuery So don't forgot to add the reference of jQuery library. My next article will explains about the action filters in MVC. I hope this article is useful for all readers. If you have any suggestion please contact me.